Fire Extinguishers as a Self-Defense Tool? In light of the horrific recent events of random shootings in public places, most people can’t help but wonder about their own self-defense and how they would handle such a situation unarmed. Just imagine if you could protect yourself from a public shooting with a non-lethal weapon just hanging on the wall, possibly within arm’s reach. You can, with a fire extinguisher. Most people wouldn’t think of using a fire extinguisher for self-defense, but actually, dry chemical fire extinguishers make good non-lethal weapons. What happens if you shoot a fire extinguisher at an attacker? It can slow, stop or incapacitate them depending on how close you are to the target, because the dry powder fire extinguishers shoot their streams at high speeds. The stream travels for 12 to 20 feet, and covers an area considerably larger than that of pepper spray. The chemical stream can get into the attacker’s nose, mouth, and eyes. The attacker will try to clean their face and this diversion could buy enough time to disarm them and save lives. Random shooters are often unprepared for a person to fight back, and the range of the fire extinguisher can create a cloud to obscure the area and diffuse the situation. 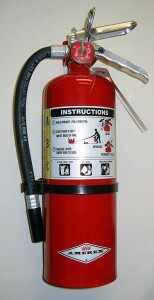 Fire extinguishers are always around, in a convenient location, ready to use. They are easy to operate, and easy to find in public places where other weapons are not available or are banned (like in the case of schools). It’s a good idea to get familiar with fire extinguishers. —Pull the pin. Hold the extinguisher with the nozzle pointing away from you and release the locking mechanism. —Aim low. Point the extinguisher at the base of the fire. —Squeeze the lever slowly and evenly. –Sweep the nozzle from side-to-side. Until we have seen the end of random violence in our country, it is important to know your options in an emergency situation. Having more fire extinguishers around can help keep you safe from more than just fires! For more information about how you can make fire extinguishers more accessible in your home or workplace or for fire extinguisher training for emergency situations, contact Total Fire & Safety at 630-960-5060. Category: Fire Extinguishers, Fire News, Fire Safety Tags: Fire Extinguisher, fire extinguisher as weapon, fire extinguisher self defense, gun control, gun safety, orlando shooting, public security, school shooting safety, shooter self defense | Comments Off on Fire Extinguishers as a Self-Defense Tool?